Before anything else, Light-Tech Inc. is an electrical contractor and all our crew are licensed electricians. As such, Light-Tech Inc. has provided complete electrical and lighting installation from start to finish for some of the most beautiful and modern homes in the Houston area including River Oaks, Tanglewood, Bellaire, West University, Memorial, and Sugar Land. Our licensed Master Electrician will follow the latest electrical codes to design the perfect lighting design and supervise the job from start to finish in order to minimize and prevent costly repairs and service calls in the future. 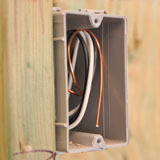 Professional wiring is the first step in preventing future electrical and lighting problems. We know this because often times we are called in after the other guys to fix their mistakes! Our electricians have wired single, two, or three story homes as well as luxury high-rise and mid-rise condos and town homes. We create relationships with new home owners and are always there for future and lighting needs.